The weather is warming up and I can’t get the thought of late nights on our back patio out of my mind. Our house is the destination for a lot of impromptu grill outs and there are times when I need to put together something delicious and fairly quick: enter this coleslaw. It was originally developed by Real Food Ready as a side to accompany her amazing Buttered Chick Peas. So if you’re looking for an great meal delivery option, head on over and check her out! Crunchy, marinated cruciferous veggies go great with bbq meats, burgers, and sammies. The bright acidity lifts up spicy sauces (it’s science) and the crunch is the added texture you crave with meats that are falling off the bone after a low and slow cooking process. And it’s nutritious as heck. This dish is low calorie (we’re skipping out on the mayo, remember) and packed with veggies, so when you’re filling up your plate you can indulge with abandon. Let’s talk about the flavor profile for a second. This dish isn’t your run of the mill coleslaw. We’re giving it a twist with some eastern spices: turmeric, cumin, coriander and cilantro and topping it off with crunchy peanuts. But why ditch the mayo? Besides the fact that some people (me NOT included) avoid the stuff like the plague, subbing mayo for oil and spices makes this dish vegan, ensuring there’s something for everyone. The more versatile a recipe is, the more I love it, and when it comes to slaw, you can make it to your preference. Have some carrots that need to be used up? Slice em thin and throw em in! Think some green onion would work well? Great, me too! Here are the basic building blocks of a coleslaw, so when it comes down to you it you can incorporate what you like. The one thing you must include (in my opinion) is cabbage. You can do green, purple, nappa, or savoy. Cabbage is the foundation of a slaw but you can also add in thinly sliced carrots, sweet or red onion, green onion, fennel and broccoli stems. The sky is the limit! Just make sure you cut all your veggies in a similar manner so all of your ingredients absorb the dressing at a similar rate. Julienne (thinly sliced into long strips) is traditional. You can make this even easier on yourself by getting a pre-bagged coleslaw mix too! Traditionally, coleslaw doesn’t have a whole lot going on in the spice department and I love how this recipe gives it a delicious eastern-inspired twist. This recipe calls for cilantro, cumin, coriander and turmeric, but you can also use pinch of cayenne, some celery seed, or even a touch of garlic or onion powder. What takes coleslaw from a bowl of unappetizing veggies to a dish you want to smoother on everything is the dressing. A combination of oil and acid, dressing for coleslaw does the important job of softening and breaking down the veggies and also acts as a vessel to impart the flavor of the spices into the cabbage itself. You can use any neutral-tasting oil. For the acidic component, lime goes great with this recipe but you can also use white vinegar, apple cider vinegar, red wine vinegar or lemon juice. Optionally, you can top it all off with a little extra something like peanuts or chashews in this case. In a more traditional slaw, I would add in a little chopped parsley or even almond slivers. It’s so easy and comes together in minutes. This recipe is broken up into three easy steps: prepping your veggies, making your dressing, and mixing it all together. It really couldn’t be simpler and don’t forget, if you’re in a time crunch, an already bagged slaw mix will do just fine! Start with veggie prep: chop up your cabbage into thinly sliced strands, coarsely chop the cilantro and chop or crush your nuts. Then, mix together the dressing by combing oil, vinegar and spices. Combing the cabbage in a serving bowl and mix in your dressing. Then top with cilantro and peanuts or cashews and lightly toss to combine. Let it set for 30 minutes to an hour before serving to let the dressing do it’s work and mingle with the veggies, softening them and imparting flavor. So what are you waiting for? Save this recipe so you can bring the crunch to your next cookout. 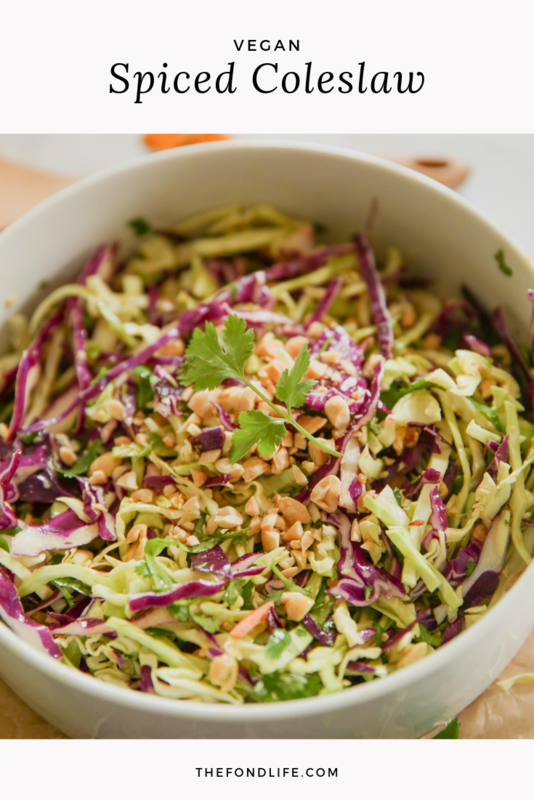 This vegan coleslaw comes together in minutes and is the perfect side for your next bbq. In a small bowl, combine dressing ingredients and whisk until well combined. Crush the peanuts/cashews until slightly crumbly, but a few small pieces remain. The texture should be fine enough that it mixes well into the slaw, but not powdery. Add coleslaw mix to a medium sized bowl and pour dressing over top. Using your hands, work the dressing into the slaw mix. This will assure it is well coated, and will gently soften the texture of the cabbage. Finally, add fresh herbs and ground nuts. Toss to combine. What I love about slaw is how versatile it is. If you're feeling different ingredients like julienned broccoli stems, carrots  or different type of cabbage, go for it! Just keep the total weight of your veg to about 1 lb.